Over the past 5 years, SDSU School Psychology Program faculty, students and alumni have published 17 peer-reviewed articles, with an additional 3 being currently under review. Students have the opportunity to collaborate with faculty on research projects and conduct their own research as the primary investigator. Additonally, many students and faculty have presented together at numerous conferences at the state-wide and nation-wide level (take a look at the 50+ presentations over the last 5 years). Below are a list of published articles by both faculty and staff. Robinson-Zañartu, C. & Aganza, J. S. (In press). Culturally responsive mediated learning in 21stCentury schools.In B. L. Chua & I. Wong Yuen Fun. (Ed.) Advances in Mediated Learning Experience for the 21stCentury: Competencies, Contexts and Culture. Cengage Learning Asia Pte Ltd.
Dauphinais, P., Robinson-Zañartu, C., Charley, E., Melroe, O., & Baas, S. (2018, Sept.).Using the Indigenous Conceptual Framework in Assessment: A Native American Perspective–Part I. NASP Communiqúe, 47, 1, 24-25. Gamble, B. E., & Lambros, K.M (2018). School-Based Mental Health Provider Perspectives on Social Capital Networks. American International Journal of Humanities and Social Science, 4(1), 7-14. Robinson-Zañartu, C.,Mendoza, N., Wager, J. D., & Mesa, D. (2017). Response to Mediated Intervention (RTMI): Dynamic Assessment in Context. Educational & Child Psychology, 34(1), 39-54. Charley, E., Robinson-Zañartu, C.,Melroe, O., Dauphinais, P. & Baas, S. (2015, Dec). Using the NASP framework for effective practice with Indigenous youth, families, and communities. NASP Communiqué, 44(4), 1, 20. Gamble, B. E., & Lambros, K.M. (2014). Provider perspectives on school-based mental health for urban minority youth: Access and services. Journal of Urban Learning, Teaching, and Research, 10, 57-71. Valenzuela, V., Gutierrez, G., & Lambros, K.M. (2014). Response to intervention: Using single case design to examine the impact of tier 2 mathematics interventions. School Psychology Forum: Research in Practice, 8(3), 144-155. Krier, J. & Lambros, K.M. (under review). Increasing Joint Attention and Social Play through Peer Mediated Intervention: A Single Case Design. Behavior Analysis in Practice. 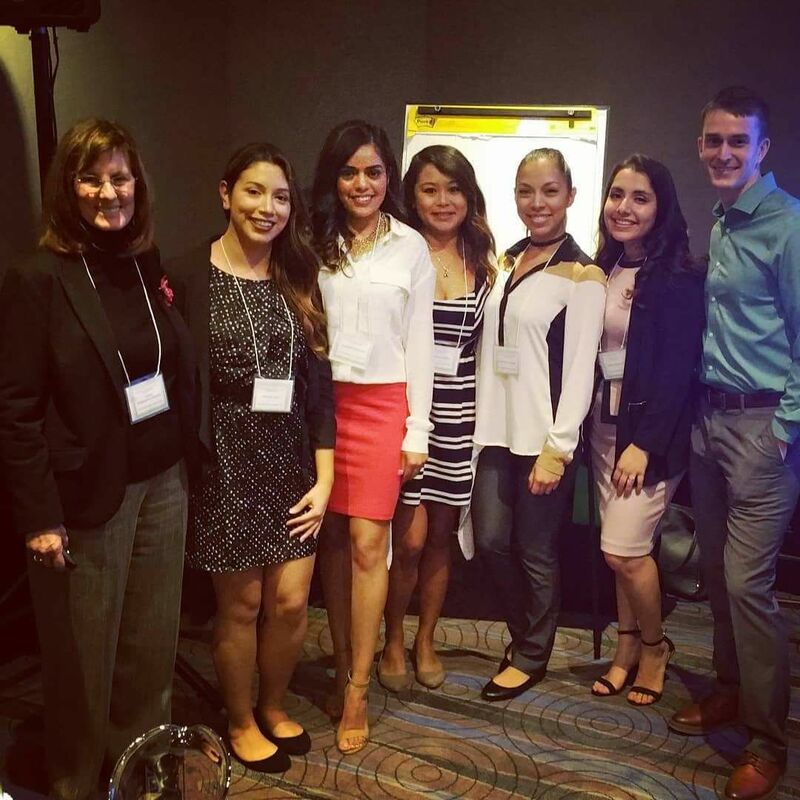 Third year SDSU School Psychology students presented their research at the California Association of School Psychologists Convention 2018. Congratulations to Jennifer Dowlan Steen for winning the Michael Goodman Award for Most Outstanding Research Poster/Paper, Shameeka Lewis for receiving the Cultural and Linguistic Diversity Scholarship and Amanda Whiteley for receiving the Paul Henkin/Suzanne Fisher Scholarship. The SDSU School Psychology Program welcomes the Class of 2022! Two outstanding School Psychology Ed.S. graduating students, Emily Johnson and Kenia Lopez, are being featured as the College of Education Class of 2018 Standouts! Emily Johnson, M.S., Ed.S. Kenia Lopez, M.S., Ed.S. Members of the CLASS-EL grant present at the International Association for Cognitive Education and Psychology 2018 in Guadalajara! 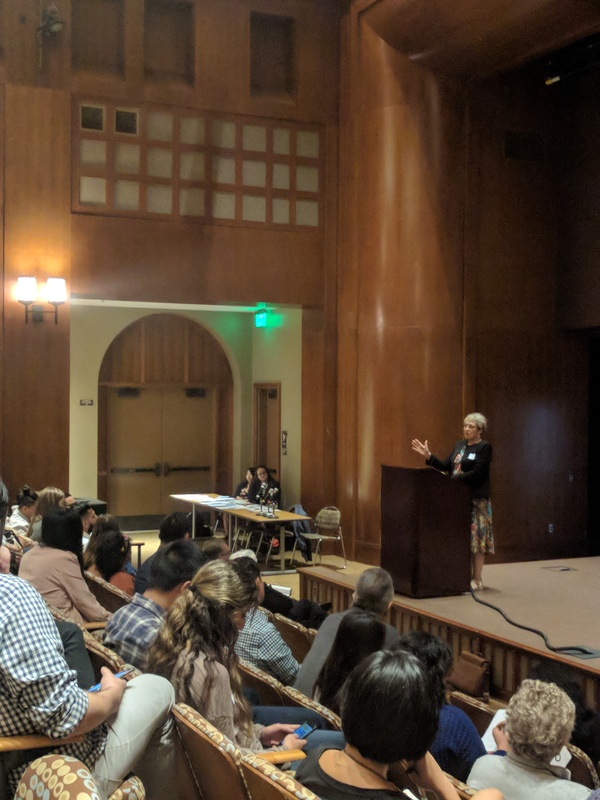 Read more about the conference in SDSU graduate student Andrew J. Newcombe's published article entitled "IACEP Guadalajara from a First-Time Attendee's Perspective" in the The Thinking Teacher. Check out all the presentations given at the 2018 National Association of School Psychologists (NASP) Annual Convention by SDSU School Psychology faculty and students! 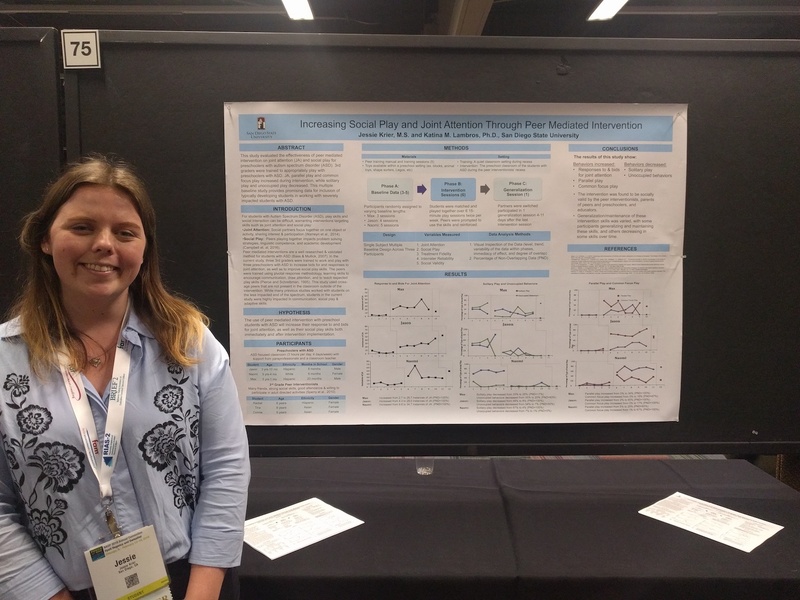 Pictured below: Jessie Krier presents her study, co-authored by SDSU School Psychology Program Director and Professor Dr. Katina Lambros, "Increasing Social Play and Joint Attention Through Peer Mediated Intervention." Congratulations to SDSU School Psychology student Nora Neztsosie- she is the winner of the Deborah Peek Crockett Minority Scholarship Award! Read more about Nora's accomplishments. The Counseling and School Psychology Department had their first ever CSP Department Day in November, 2017! Students learned about decolonizing practices and research from keynote speaker Dr. Linda Tuhawai Smith, Professor of Indigenous Education at the University of Waikato in New Zealand. 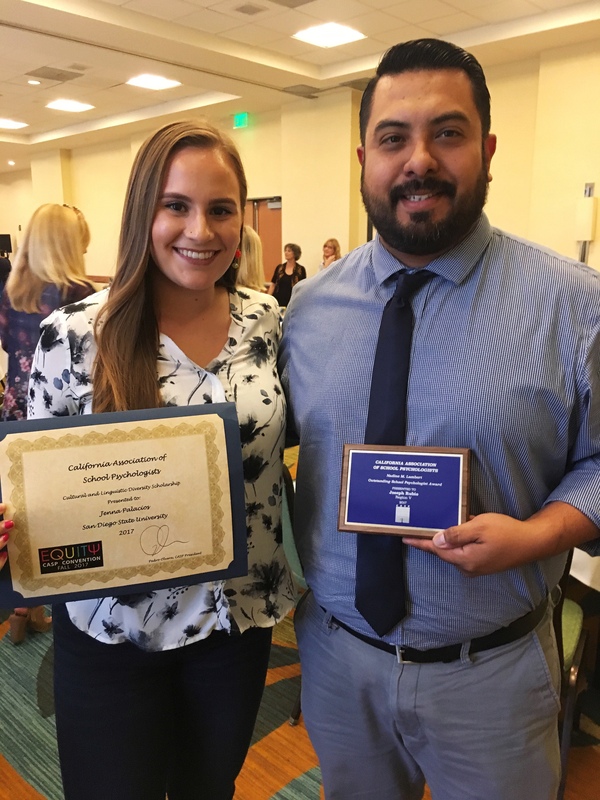 Dr. Gabe Gutierrez and current student Sarah Nakutin won the Provost's Award at the SDSU Student Research Symposium (SRS). To learn more about joining the California Association of School Psychologists, visit their website. 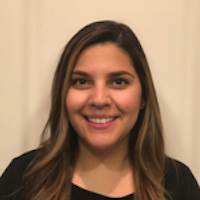 Congratulations to SDSU School Psychology Intern and 2017 CASP Cultural and Linguistic Diversity Scholar Jenna Palacios! The Raymond M. Peterson Scholarship is provided by the Foundation for Developmental Disabilities. The scholarship supports the education of future professionals who are working to make a positive difference in the lives of those affected by a developmental disability. The $1000 scholarship recipients are: Amanda Whiteley, Al Yu, Jessie Krier, Cristina Prado, Angela Cerda, Paul Pham and Anais Medina Flores. Congratulations! In third grade, after Elaine Chen had been falling behind in her work for a while, teachers at her San Francisco Bay Area school assessed her and recommended she be placed in a special education program. "I remember going through many cognitive tests, only to have them determine my struggles weren't caused by a learning disability but rather a language barrier," says Chen, whose first language was Mandarin and who didn't learn English until kindergarten. Today Chen, 28, is a school pscyhologist and behaviorist in the San Mateo-Foster City School Distrcit in California. She meets with elementary school students who are struggling to try to understand why. Read the full article at U.S. News & World Report: Education Master's Degree Can Guide Students, Families To Success. Jenna Palacios, M.S., third year student, was awarded the Dean's Award for the College of Education at the Student Reseach Symposium. Jenna has worked extremely hard presenting her poster session at various conferences and conventions. We are very proud of Jenna! Second year students, AJ Newcombe and Angela Cerda, presented on "Opening Communication and Bridging Knowledge: Increasing Involvement of Parents of Latino High School Students." 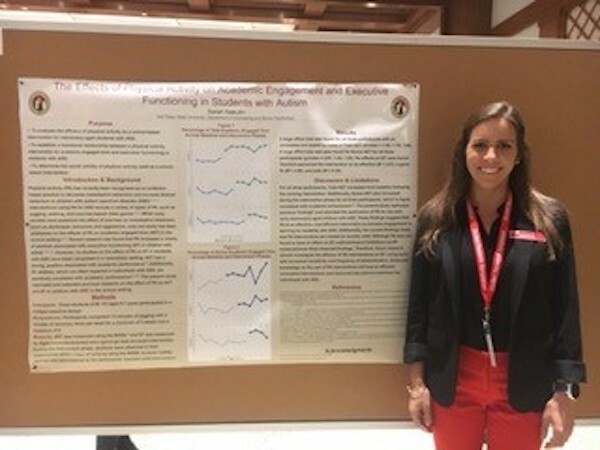 Jenna Palacios, M.S., third year student presented a poster session on "The Impact of Native Language Literacy Interventions on Bilingual Reading Fluency." Faculty, Dr. Lambros, supported Jenna during her poster session and while gathering data for her intervention. Third year students (Emily Johnson, M.S. ; Kenia Lopez, M.S. ; and Anais Medina Flores, M.S.) presented with faculty, Dr. Ingraham, about consultation in diverse schools. First year students eagerly attend their first NASP convention! Jenna Palacios, M.S., 3rd year student, presented her single case design intervention at CASP 2016. Dr. Gutierrez, Ph.D., NCSP (SP lecturer) supported Jenna during her poster session. 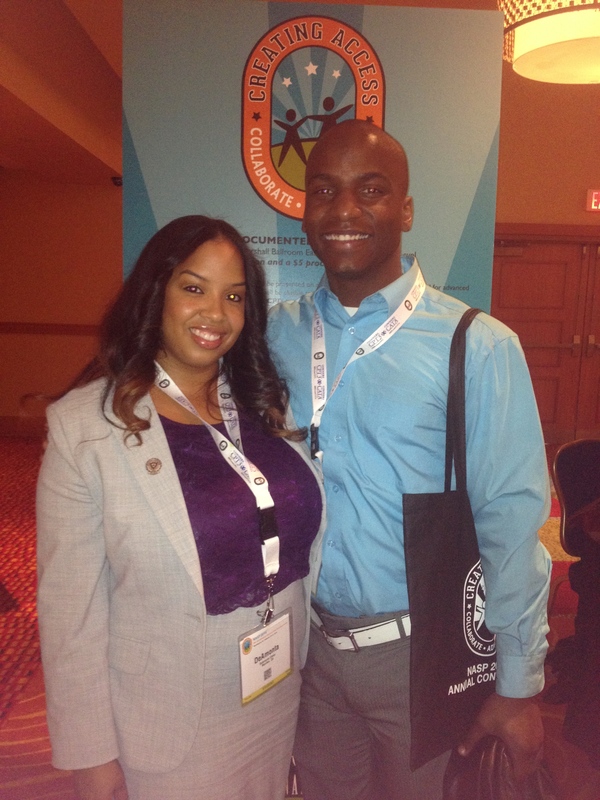 Paul and Angela, 2nd year students, attended CASP 2016 convention. 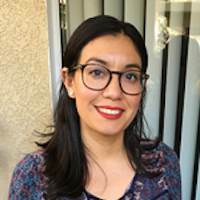 Six graduate students in the Department of Counseling and School Psychology have received a scholarship from the Foundation for Developmental Disabilities in San Diego. The $2,500 scholarship recipients are: Christine Horton, Jessie Krier, Sofie Lische, Anais Medina Flores, Paul Pham, and Andrew Newcombe. "My focus is to advocate for and improve the lives of students with disabilities," said Krier, a 3rd year graduate student in School Psychology. "As a future school psychologist, I hope to empower and support students of all walks of life by removing learning barriers, whether emotional, behavioral, or academic," said Lische, a 3rd year graduate student. Read the full blog post at Informed & Inspired: News from the SDSU College of Education. Paul Pham, a second year graduate student in the School Psychology program, spent his summer in Quito, the capital of Ecuador. He went there through the Ecuador Professional Preparation Program, a study abroad program for mental health practitioners, education professionals and graduate students. "The program provided me with opportunities and experiences to develop both professionally and personally. One experience that I will treasure is my time with the local preschool in Quito. I was matched to work with other professionals in the field of education and psychology and together we supported [it], " said Pham. Students and faculty participated in our annual Open House (2015). On October 16 at the CASP annual convention, our very own Nicole Edwards, M.A., was the recipient of the CASP-CLD Scholarship Award. She was presented with her award at the CASP Awards Luncheon. This is Nicole's second time winning this prestigious award from CASP! We are all so proud of her and how beautifully she represents our program. Congratulations Nicole! Dr. Ingraham and Nicole Edwards celebrate at CASP 2015. "Yá'át'ééh. Hello. I am Diné/Navajo and come from a small community on the Navajo reservation in Arizona called Tuba City. I am of the Blacksheep clan, born for the Towering house clan. My maternal grandmother's clan is Bitter Water and my paternal grandfather's clan is Edge Water. Growing up, I attended multiple schools on the reservation, where a majority of the students and teachers were Navajo. Despite being surrounded by my own Navajo people, I still felt like I didn't quite fit in or belong. I was either not Navajo enough or too Navajo. I was either belittled for not knowing my language or not acknowledged at all for practicing my Navajo traditions, because students and teachers were either less or more acculturated to modern ways than me." Read the full the full blog post by Alyssa Ashley, SDSU School Pscyhology alumna, at Pearson Education (published by personed.com). School Psychology students participated in a month long summer immersion in Oaxaca, Mexico as part of the CLASS-EL grant project. David Martinez, M.A., third year trainee in our program, was notified that he is being awarded a 2015 NASP-ERT Scholarship! This is a wonderful news for David and also for our program; he will receive the award at the NASP convention in Orlando in February, 2015. David has done so many things that have led up to this national award. He worked for 1.5 years at Cherokee Point on the Wellness and Restorative Practices Partnership, teaching restorative practices in classrooms and working hard to empower and engage families, especially Spanish speaking families, in the school community; he participate in the summer immersion in Oaxaca, Mexico with CIELO; he is volunteering as a Graduate Assistant for the Family-School Collaboration class this semester; he has sought out extra training to serve students in military-connected schools; presented at the 2014 NASP and CASP conventions; and more! 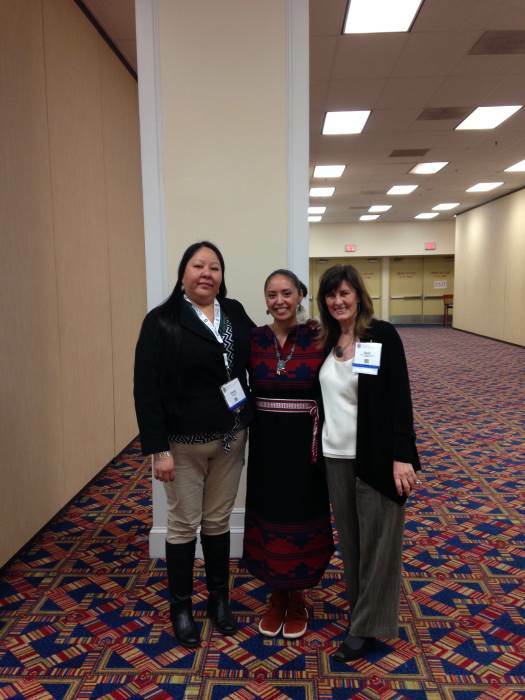 Colette Ingraham and graduate students presented at CASP 2014. Their presentation was titled Transforming School Climate and Reducing Behavior Referrals Through Multi-Tiered Restorative Practices. SDSU’s School Psychology faculty, students and alumni received honors and awards, and gave multiple presentations at this year’s National Association of School Psychologists (February, 2014 in Washington, D.C.). 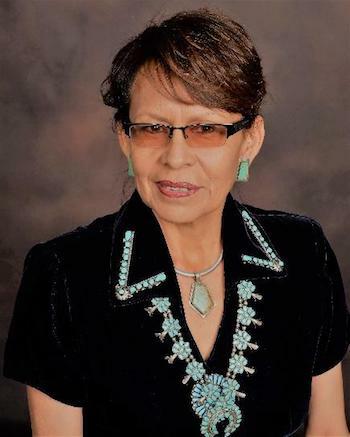 The conference was opened by 2006 SDSU graduate Elvina Charley, who offered a traditional Navajo opening and song to the audience of close to 5000. Alyssa Ashley received the NASP Minority Scholar Award for 2014, the first to go to a Native American school psychology graduate student. Carol Robinson-Zañartu was 2014 Distinguished Lecturer, speaking on Diversity, Mindset, Worldview: Lessons That Cross Cultures and Continents, for which she received an award of recognition. She also received a Presidential Award for Collaboration, Advocacy and Leadership on Behalf of NASP. Graduate student and Project CARES Scholar, DeAmonta Casey was selected to present on Supporting CLD Children in Foster Care on NASP’s Diversity Dialogue panel. Colette Ingraham co-chaired two sessions of the NASP Consultee-Centered Consultation Interest Group. Dr. Colette Ingraham led a symposium with 8 SDSU graduate students presenting their research on restorative practices in CLD schools. DeAmonta Casey pictured with fellow graduate student cohort member and CARES Scholar Daunte Haynes. SDSU Making an Impact at NASP 2013 in Seattle, Washington! 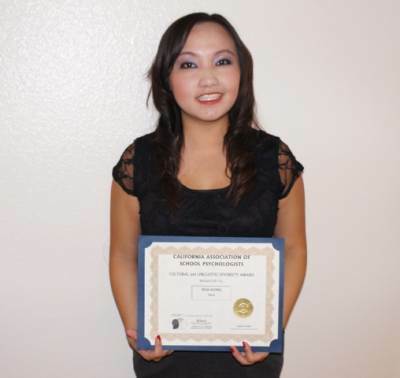 Boa Xiong Receives the California of Association of School Psychologists (CASP) Cultural and Linguistic Diverse Scholarship 2012!